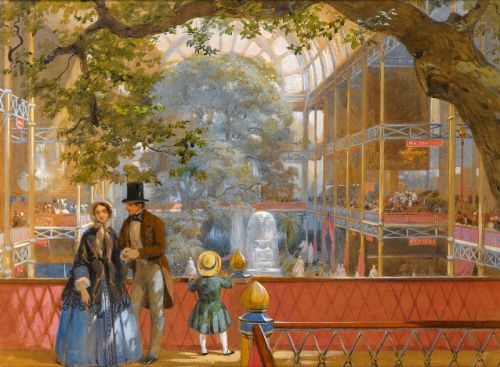 The Great Exhibition of 1851, under the patronage of Prince Albert, took place at Hyde Park in a building that became known as the 'Crystal Palace'. This revolutionary glass and iron building was designed by Joseph Paxton and Charles Fox. With a committee overseeing its construction that included Isambard Kingdom Brunel, it went from a plan to the grand opening in just nine months. The exhibition was a showcase to display the wonders of industry and manufacturing from around the modern world. It included over 13,000 exhibits and was extremely popular, attracting more than six million visitors - equivalent to a third of the population of Great Britain at the time. The profits from the exhibition helped fund the construction of the Victoria and Albert and Science Museums in South Kensington. This watercolour of the main Transept from the South Gallery was used as a template for one of the twenty-five hand coloured lithographs created by Day & Son for a book published in 1851 by Lloyds Brothers & Co, 'Recollections of the Great Exhibition 1851'.